The internet was a grand social experiment back in the day. Using open standards (Internet, email, etc), *anyone* could share information across the globe. However, the last 15 or so years has seen the Web snowball from a realm for geeks into big business and commerce. ...and where there’s money, the criminals will follow. Web-crime takes many forms. Early-on, the primary form of malware (aka “Bad Software”) was the virus. Then came “Trojan Horse” malware, “attack sites”, and adware — all threats of which we should be aware. It’s geeky, but the thing to know is that there are websites that will attempt to scare or persuade you into doing something risky — often installing software (which is almost always malware) or prompting you to contact “Tech Support,” who’ll attempt to charge you, install malware, or both. Malware isn’t just an annoyance — it can cause identity theft, credit card hacking, and the theft of your online identity (“They posted WHAT onto my FaceBook feed?!?”). I often compare being “savvy” on the web or email to walking down the street in a city. As you walk by an alley, a stranger (well dressed or not) offers you a brownie. Um, no, thank you — you walk away...fast. In contrast, if it’s someone you’re *familiar* with, you might accept the brownie to be polite, but probably not eat it. You’d shove it in a pocket and then toss it when you get home. Finally, if a close friend or family member offers you a brownie, you’ll likely accept it. That is, unless it looks or smells odd (“Hmmm... anchovies? Um, thanks.” Trash can). Also, if you pass a bakery and there’s a person wearing a shirt with the bakery’s logo on it, offering brownies, you’d probably accept the brownie …barring anchovies, of course. 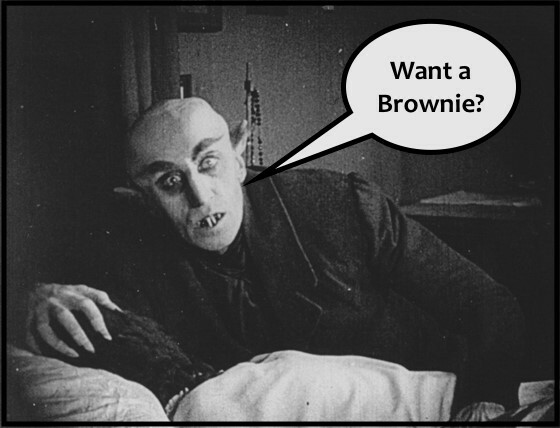 What does a brownie have to do with the “evil internet”? When someone offers you a software update or you want a recipe or clothing pattern from their site, consider the source: is this on Amazon.com or “BillsDownloadEmporium.com”? Amazon is a well-known and safe commerce site. The BillsDownloadEmporium site? Not so much. Be *very* cautious! Always consider the source. Look at the email address that is sending you the email, look at the Internet access to which you’re being directed and never answer pop-up, online requests for your personal or financial information unless you like risking identity theft. Here’s an example of the “Evil Internet” — this website is “helpfully” offering you a free update to your “out of date” Flash software. Do. Not. Trust. It! I downloaded it and looked over it over. Malware. Any time you see an alert that *scares* you (scary messages like “You’ve got a virus!”) do NOT believe anything or do anything they say. Close the webpage or force-quit your browser if needed. If you see something that you’re suspicious of, “trust your gut” and avoid it. Also, iTech-Maine is here to help. When in doubt, call me or email me a screenshot and ask if you should trust it. Stay safe out there!